Grassroots organizations, service providers, homeless advocates, students, and politicians are rallying across the country to convey the message that homeless individuals have civil rights that must to be fully respected and protected. Other states, including Delaware, Missouri, Oregon, Tennessee, and Vermont, are working to pass similar legislation in their communities. Rhode Island and Puerto Rico have already enacted Homeless Bills of Rights. 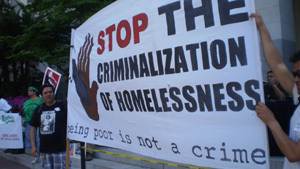 The National Coalition for the Homeless understands the weight and value Homeless Bill of Rights hold. Unfortunately, without these essential documents, un-housed persons face harassment or criminal charges for resting, receiving meals, asking for monetary assistance, and having personal property in public spaces (just to name a few). National Coalition for the Homeless Newsletter.